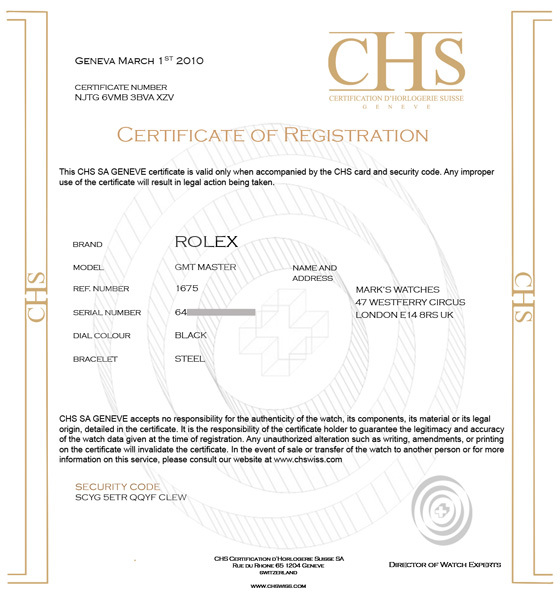 The CHS certificate registers the information provided by the customer about the watch; brand, serial number, model reference number and movement number. The information on this document is then entered into the International Archives of CHS (with full customer privacy). This process records the data of a new watch, as well as being a secure identification document for antique and vintage timepieces. These watches have been in the marketplace for years and their traceability needs to be safeguarded, as it can increase their commercial value. The chosen format can be selected during certificate registration in the International Archives section. The certificate costs 195 CHF (Swiss Francs) and is issued within 30 days of the receipt of payment in swiss francs either by credit card payment or bank transfer. In the event that the customer decides to sell or transfer the watch to another person, the registered name in the database for that watch can be changed without charge. This process does not affect the validity of the certificate, providing that the alterations are supplied with the Security code (found on the CHS card). To make this modification, the customer must go to the CHS webpage, click on "transfer a certificate", and enter the Security code. CHS will then send the previous customer an email, and, if after 15 days no objection is made to this request, the transfer will take place automatically. If the certificate document is lost, it can be reissued by paying the cost of replacing the document.